We have been carrying out valuable work within communities in Lincoln and Lincolnshire since 1997, and look forward to many more years to come. If you would like to support our work and make a contribution, we welcome donations towards the projects that we run. Cheques: Made payable to Lincoln Community Development Worker Project, can be sent to developmentplus, The Old Vicarage, Croft Street, Lincoln, LN2 5AX or popped through our letterbox. Cash: Can be hand-delivered to us at the address above. 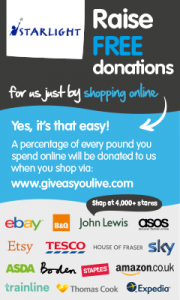 You can even raise funds for us as you shop! We’re signed up to Give As You Live, so every time you purchase something via this link, you’ll help our projects! Any donation, no matter how small, is very gratefully received!